Many people who come into contact with someone with eczema may think they have some kind of allergy. Eczema isn’t an allergy, but it is closely associated with allergies. Eczema is a skin condition that can be made worse by the presence of allergens, such as some foods, pollen, dust, mold, and animal dander. 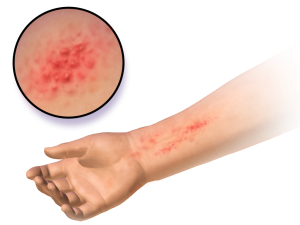 Eczema is generally caused by atopic dermatitis; it has the appearance of very dry, flakey, and scaly skin. Eczema is fairly common in babies, children, and some adults. If you have eczema, you or someone in your family probably have seasonal allergies and/or asthma. If you have eczema, or had it as a child, it is likely that you will have a child with eczema. Approximately one out of every ten children will develop eczema. Surprisingly, about half of all the people with eczema will develop asthma, hay fever and/or other allergies. Eczema, at best, can be bothersome; however, it can be debilitating to some sufferers. Many children with severe eczema want to scratch their itchy skin; however, scratching is the worst thing they can do. Scratching the skin makes eczema even worse. It is not uncommon to see children scratch themselves until they draw blood to the surface. The itch is unbearable. Fragrances and chemicals in many different kinds of soap will exacerbate the symptoms of eczema. If you find a brand of soap that doesn’t cause the skin to become more irritated, stick with it. Laundry detergent is another substance that can make the symptoms of eczema worse. Ivory Snow is one brand of laundry detergent that is usually well tolerated by eczema sufferers. Eczema can appear on the face, head, legs, hands, wrists, ankles, and eyelids. It’s not very common that you would have eczema show up on all the mentioned areas; however, there are a small percentage of individuals who do suffer with eczema in all of these areas at once. Usually people who had eczema as children “grew out of it” by the time they reached early adulthood. Growing out of eczema is actually going into remission, where the symptoms no longer appear. However, under some kinds of stress, the symptoms of eczema can reappear in some people. There is no way to prevent eczema, because it appears to be passed through the genes. However, since eczema seems to be made worse by the presence of allergens, you should try to avoid contact with mold, pollen, animal dander, dust and other allergens. It would help to keep the inside of your home free of allergens by using an air purifier with a HEPA filter to trap all the particles in the air in your home. You might also consider having more than one air purifier. You might also put a dehumidifier somewhere in the home to keep the humidity at a level which will reduce the presence of mold spores in the air. Certain foods can also make the symptoms of eczema worse. Tomatoes and lemons are acidic, which are foods that tend to trigger violent itching of the skin. People with eczema tend to feel better when the temperature of the home is cool, because excessive heat will make the itching worse. If you have eczema, the worst thing you can do is smoke. If you have a child with eczema, you should not allow any smoking in the home, because even passive smoking will irritate the condition. Certain fabrics can make the symptoms of eczema worse; avoid course fabrics, including wool. Eczema is not an allergy, but the symptoms behave very much like an allergic response, and almost any allergen can trigger eczema to appear on the skin. If I have allergies does that mean that I have asthma?